Tag Archives for " Trukan "
Shooting combination practice involves working on starting speed around the penalty box. This is important for players in order to gain advantage near the goal and be able to get to the ball before the defender. This in turn will help players to get into more goal scoring situations and eventually, score more goals. In this practice, the conditioning element is therefore linked to technical content of finishing as well as combination play in the final third. Organise two goals opposite to each other, 30 yards apart. Set up a cone next to the goal which will be starting point of the exercise. Organise further two cones (one on the angle to the left from the starting point and one on the angle to the right). There should be minimum 8-10 yards distance between the cones Set up a gate using two poles as shown on the diagram below. Divide the players into two groups. Set one player each on the cones in the middle and the rest of the players with one ball each on the starting cone. Goalkeepers should be set and ready in goals. The practice starts with first player with the ball passing it to the player positioned on the cones to his left. The ball is then returned back on the angle using one touch. Both groups start at the same time. The player that started the practice passes the ball to the player positioned on the cone to his right. This pass is crucial for next sequence of the pattern and therefore should be played with high quality (allowing the receiver to play off one touch). Following that, the receiver sets the ball on the angle. At the same time, the second player in a sequence makes a quick and sharp movement through the gate to then sprint onto the ball and finish in goal. This should be done on maximal speed. Players rotate clockwise (‘starting’ player-‘shooting’ player-‘setting’ player). As soon as one pattern finishes, the next one should start immediately to ensure appropriate work to rest ratios and flow of the practice. Each player should make 8-10 repetitions as a ‘shooting’ player. This should be done in 2-4 series with 30 second rest (working as a ‘starting’ or ‘setting’ player) between repetitions and 4 minutes between series. This is one of 28 articles and training sessions on conditioning and other topics that will be published this month in the Training Center. Click Here to learn how you can receive access to all of them. This practice is designed to improve players’ ability to recover between high intensity actions in a most efficient way. This will allow players to sustain the quality (speed and strength) of their actions for longer throughout the game. These physical outcomes are achieved in a highly technically demanding game containing a lot of crossing and finishing. Small amount of players on each side ensure high intensity and engagement of the players. 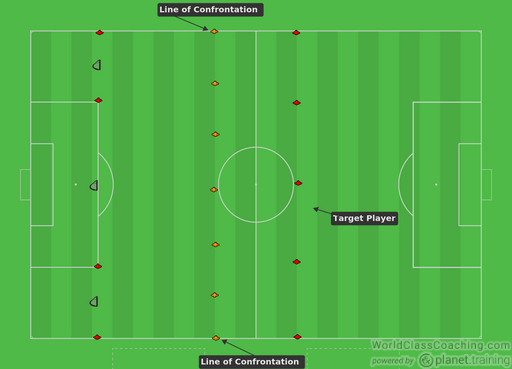 Organise a pitch of 25 x 20 yards with three zones – two wide zones (5 yards wide each) and central zone (15 yards wide). Set up two goals on the opposite ends as shown on the diagram below. Divide the group into two teams of three. Set the goalkeepers in goals. Prepare a sufficient supply of balls to ensure flow of the practice. The practice starts with a goalkeeper passing to any of the teams. After this, the aim of the team in possession is to make 3 consecutive passes. This should be completed in the middle part of the pitch. As soon as the 3 passes are made, the ball can be played into one of the wide areas to the player making a movement there (max. two attacking players can be in one wide area). Only one defender can tackle in wide area. The attacking team can have only three entries into wide areas per attack what will encourage quicker turn overs of possession and more crosses. The ball can be delivered both aerially and on the ground. As the wide player is about to deliver the ball, the other players should look to make explosive forward movements to finish. If the ball goes out for a corner, it is restarted from the opposite goalkeeper (no corners). The practice should last 1-3 minutes and be repeated 6-10 times in 2 series. Rest between repetitions should be 1-3 minutes and between series, 4 minutes.